How are some companies decreasing audit fees in the face of pressure to increase them? 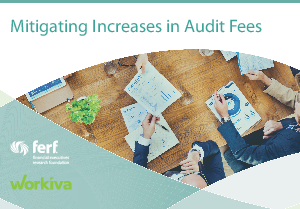 In this follow-up report to the 2015 Audit Fee Survey, Financial Executives Research Foundation interviewed several senior-level financial executives and audit partners. These interviews revealed best practices in mitigating increases in audit fees and how to work more efficiently and effectively with auditors. Access this report to learn the reasons for increased audit fees and the impact of PCAOB inspections. You'll also discover how to review current audit focus areas, improve internal controls, automate processes, and review audit hours and fees.